Age Limit : Minimum and maximum age restrict is eighteen years to 65 years. 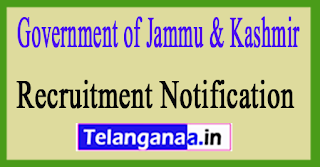 How to Apply : Interested candidates may also practice in Prescribed utility form together with attested photocopies of qualifications, Experience certificate & Character Certificates send to the Chairman ATM Management Committee (Chief Agriculture Officer), Rajouri on or before 27.11.2017. Qualification - 10th or 12th examination pass. Age Relaxation - RBA/ALC/SOC/SC/ST Candidates 3 years, PWD Candidates 2 years & Ex-servicemen 8 years. Application Fee - Candidates have to pay Rs. 100/- through any branch of Jammu & Kashmir in favour of LAHD-SSRB A/c No. 0069010200000771. How to Apply -Interested candidates may submit their application in a prescribed application form together with all relevant documents, experiences, new passport photo and a self-addressed envelope of size 5 × 10 with a stamp of Rs. 5 / - for local & Rs 22 / - for outside the district to the office of secretary Leh Autonoous Hill Development Subordinate service recruitment committee on or before 06.07.2017. Government of Jammu & Kashmir Housing and Urban Development Department Recruitment Notification 2017 The Post of 56 Municipal/ Civil Project Engineer Specialist, MIS Specialist-Last Date 28-04-2017. Qualification - Graduate or Post-Graduate Degree in relevant discipline with 3 to 5 years relevant experience. Fee- Candidate have to pay Rs. 500/- through Cheque in the name of State Urban Development Agency. How to Apply- Interested candidate apply in Pre-scribed application form a long with all relevant documents, experience and Application fee send by the Office of Managing Director, J&K Housing Board on or before 28.04.2017. 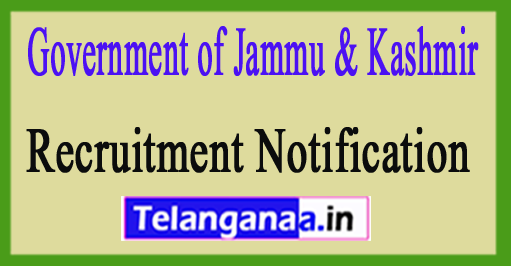 Government of Jammu & Kashmir Recruitment Notification 2017-The Post of 03 Assistant Lecturer-Last Date 15-04-2017. Qualification - Bachelor’s Degree in Hospitility administation or Hotel management after (10+2 ) from a reconged university & full time Master-degree in Hospitility and Hotel administation securing not less than 60% marks aggregate either in bachelor & master-degree.